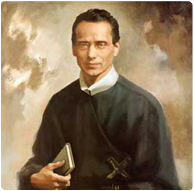 On September 25, 2010, the official Diocesan Inquiry into an alleged extraordinary healing through the intercession of Blessed Francis Xavier Seelos was finalized. Baltimore Archbishop Edwin F. O’Brien convoked the Diocesan Inquiry Phase in May 2009. The fact-finding Inquiry Panel investigated the case and heard the testimony of Mary Ellen Heibel, her primary physician and nurse, and other key witnesses, concerning Heibel’s cure of metastasized esophageal cancer. Heibel, a devout Catholic and parishioner of St. Mary’s Church in Annapolis, MD, had been cancer-free since January 2005, even though the disease had spread to her liver, lungs, back, and sternum, and medical treatment had failed. The cancer disappeared one week after she helped begin a weekly Seelos novena in her parish. On October 11, 2010, the Redemptorist Postulator General, Rev. Antonio Marrazzo, submitted the results of this investigation to the Congregation for the Causes of the Saints at the Vatican. With the Diocesan Phase of the canonization process now complete, Marrazzo’s formal petition for the Decree of Unsealing the Acts effectively begins the Roman Phase. At some point in the near future, the case will undergo proper scrutiny by Vatican authorities who will determine if the cure meets the criteria for the one miracle needed in Seelos’ canonization.